3. Melt the butter in a skillet over medium heat. Stir in the onion and celery and cook until soft. Add the minced garlic and stir for 30 seconds. 4. 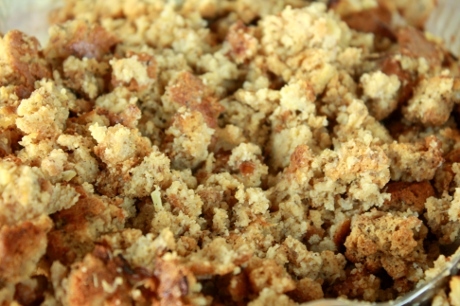 Mix the eggs and chicken broth into the bread crumbs. The mixture should be moist, but not mushy. Use water, if necessary, to attain desired consistency. Mix in the onion, celery, rubbed sage, garlic powder, salt and pepper. 5. Press the mixture into the baking dish. 6. Cover with foil and bake for 30 minutes at 350 degrees. Remove the foil and bake for another 15 minutes.